My husband and I enjoyed two days of R & R at Omega in Rhinebeck, NY last week. The retreat was a great way to take time out to reconnect with myself and reassess how I spend my (mental, emotional, and physical) energy. We unplugged, ate wholesome food, and made new friends. We did lots of scheduled group activities like JourneyDance, improv, tai chi, yoga and meditation. We connected with nature by sleeping in a tent cabin surrounded by the sounds of nature, relaxing in a hammock while watching colorful leaves fall, canoeing in the lake, and walking in the woods. We even took a workshop to learn how to strategically align our lives with the phases of the moon. 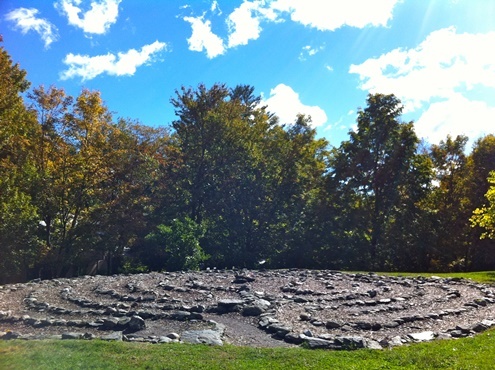 Our last activity was a group meditative walk through a labyrinth. Labyrinth Society defines a labyrinth as "a single path or unicursal tool for personal, psychological and spiritual transformation." It's also important to note that, unlike a maze, a labyrinth has one path and no dead ends. You slowly walk the winding path, get to the center, and then follow the path back out. You're encouraged to bring a question you would like answered with you. Frustrated would best describe my state of mind while walking to the center of the labyrinth. You might not be able to tell from the photo but it's probably about 4 yards wide in diameter. It's not that big. Still, it took what felt like forever to get to the middle. Also at some point during the walk in, I decided the question I had brought in with me ("What should I do about my coaching practice?") was completely wrong and insignificant. I was also angry and jealous because everyone else seemed to be in such a peaceful and meditative state. Grrr! I alternated between fantasies of leaping into the center and just walking out (because what was the point anyhow?). By the time, I reached the center of the labyrinth my new question was "How do I find the courage to grow my coaching business?" I felt confident about my question but I was doubtful I'd find the answer. Plus, I was still Totally. Dying. To. Get. Out. Everyone else still appeared zen and deeply grateful to sit with their question before slugging their way back out. At the end, our small group sat together on the grass outside the labyrinth. Everyone shared patchouli scented comments about how deep the experience was for them. It made them feel grateful, peaceful, yada yada. Everyone except me. I was too embarrassed to share my totally un-Zen experience. But here's the weird thing: I actually got something out of that experience. I noticed I was walking the labyrinth the way I walk life. Here's the loop of thoughts that played in my head: "I just wanna be at the center already dammit! Why is this taking so long? Why does everyone else look like they're having an easier and more fun time with this than me? What's wrong with me? Should I even be doing this?" I also noticed the labyrinth was like life itself. It took longer than I'd expect or prefer to get to the center- way longer- winding so that it often looked like I was moving away from the goal I was trying to reach. Once I reached the "goal" and had to walk away from it, I realized the goal wasn't even the point. It was about who I was while walking and the personal transformation I experienced. I got the answer to both my questions. (What should I do about my coaching practice? How do I find courage?) Put one foot in front of the other. Take a single step followed by another step. Understand that I don't need to have everything figured out. I don't need a big plan. In fact, it's impossible to perceive every step from where I am. I just need to keep moving forward with faith that I'll make it. I also learned I can take my frustrated, angry, jealous, and not-so-Zen voices with me on the path. Those feelings are a totally natural and acceptable part of being human. The good news is they aren't running the show and won't keep me from reaching my goal. They're just something to notice while I'm on my path. I began making these connections once we got in our car to leave. Through talking it out with my life coach Kate, I deepened the wisdom I got from walking the labyrinth. A week later, I'm still very much learning from that experience. Are you (symbolically) walking a labyrinth? Would you like to have a supportive conversation with me so that you can get extra insight and greater benefit from your experience? I'd sincerely love to hold space for you. Click here to book a sample coaching session.